With a well-earned remix refill, Cocoon Recordings is taking a bow before the Belfast-born DJ and producer Phil Kieran, whose “Shh” album from last year, like rarely another album release, was able to proof how fresh, futuristic and complex modern Techno can sound. The record starts with the Berlin-based duo Pan-Pot, which had releases on Ware, Mobilée, SCI+TEC and Sender, and turns “Blood of Barcelona” into a subsonic work horse that sends shivers down the spine fans of reductionist Techhouse á la Dubfire and Radio Slave. Also the Dutch newcomer talent Egbert van der Gugten ennobles his remix with a comparably hypnotic bass line, but lets his track drift into the sunrise with Dub elements and a choir layer so beautifully that you indeed wish for an endless loop here. The same track is reworked by Patrick Kunkel - Cocoon’s head of digital distribution - over nine and a half cliff-hanging minutes somewhere between harmonic ostinato sounds and pumping Techdub Guy-Gerber-style. 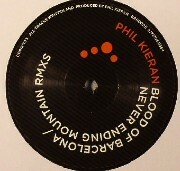 “Playing With Shadows” has been remixed by Kevin Gorman and Ingo Boss deals with “Blood Of Barcelona", just as Pan-Pot. The sextet is completed by Matador’s digital-exclusive remix of “Dirt", a track with distorted cellar noises and an unmistakable plucked bass, that is always carried by an organic warmth, in spite of all surprising noises and sounds. That’s how versatile Techno can be in 2010.